A brine pit is a surface impoundment used to store or evaporate water used in the drilling, mining, or processing industries. The brine pit water may contain salts, minerals, or toxic substances that can lead to brine contamination in groundwater. 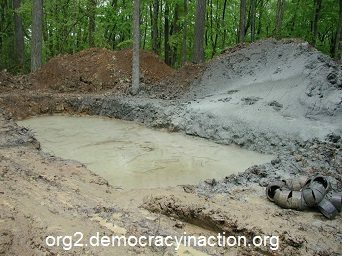 After the brine pit is no longer used, it is sometimes covered over with dirt or a liner. Once covered or buried, the brine pit location is difficult to detect visually. 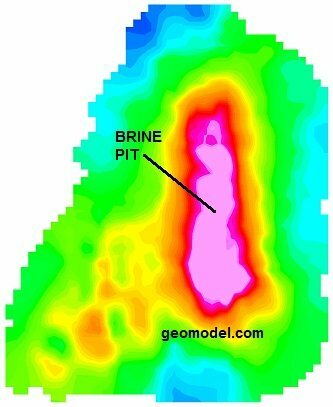 GeoModel, Inc.’s brine pit locating survey can locate a former brine pit in real time, to a depth of approximately 20 feet. Results can be obtained in a short time period, making our system cost-effective for large industrial sites, as well as for smaller sites. Buried brine pits are located and mapped in real-time using our unique technique, and can be later computer processed and color contoured for final presentation. Locating brine pits and addressing any brine contamination plume can help alleviate any costly problems with brine in the groundwater and soils. Areas of salt-water intrusion can also be detected using GeoModel’s techniques.